The John G. Zimmerman Archive is pleased to offer a limited edition print of Ken Isaacs’s Living Cube in conjunction with an exhibition of the designer's work at the Cranbrook Art Museum (June 21-October 5, 2014). 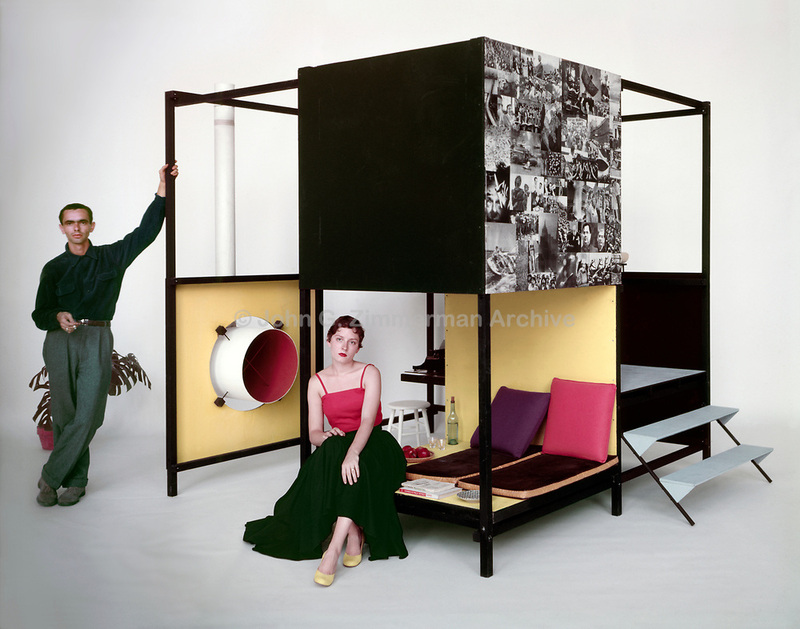 The color photo of Ken Isaacs and wife Jo with the Living Cube was taken by John G. Zimmerman for LIFE magazine in 1954 but never published. Zimmerman took hundreds of black and white photos of the Living Cube, but only a handful in color. The Cranbrook exhibit marks the first time one of the photographer's color photos has been published and made available for purchase. The edition is limited to fifty prints available in a single print size of 16 x 20 inches. Made with the finest quality archival, digital inks and printed on premium luster paper, each print is individually numbered, stamped with the archive’s unique impress and comes with a certificate of authenticity. The cost of the print is $500, plus shipping. The archive will donate 10% of all profits from Living Cube print sales to the Cranbrook Art Museum. Please contact us for details. We hope fans of mid-century modernism will enjoy this opportunity to acquire a classic portrait of Ken Isaacs with one of his signature works.